Purpose: Inspire you to DREAM BIG, ACT BIG, and ASSOCIATE BIG. Discover how to MAGNIFY YOUR IMPACT 30, 60, and even 100 fold in 52 weeks to be a CATALYST to transform our world. CLICK HERE to register for this life-changing, world-changing webinar! God prepared (equipped), called, empowered, and used Nehemiah to be a CATALYST to rebuild the walls of Jerusalem in just 52 days. I believe the Holy Spirit is calling a select group of God’s children to be empowered to become CHANGE AGENTS during the 52 weeks of 2011. You are being called by the Holy Spirit to BE a CHANGE AGENT. 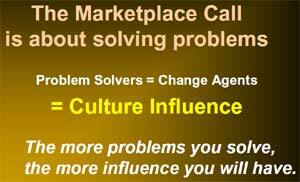 The Marketplace Call is about solving problems. Problem solvers = Change Agents = Culture Influence. The more problems you solve, the more influence you will have. The purpose of the A Life of Blessing webinar is to inspire you to DREAM BIG, ACT BIG, and ASSOCIATE BIG. Discover how to MAGNIFY YOUR IMPACT 30, 60, and even 100 fold in 52 weeks to be a CATALYST to transform our world. During this webinar, I will “PAY IT FORWARD” (i.e. bless you) by planting seeds of UNCOMMON ideas to magnify your impact 30, 60, and even 100 fold in 12 months (52 weeks of 2011). Our key scripture is Proverbs 29:18 (KJV) – Where there is no vision the people perish. Blessings to choose to step into A LIFE OF BLESSING!